Is it the coolest gadget or what? PETA may not think so. But the tree-huggers and green team is pleased as punch. This invention is a dog-powered scooter - a form of alternative to renewable fuels: dog power. Now some may think it’s cruel, but if you have seen “Eight Below” and seen how those dogs just loved the act of pulling a sled - this coolest gadget brings mush-power to the streets with more control. The animal is not out in front like traditionally with a sled - the animal is behind the front wheel- thus the rider gains precision steering and braking capability. The power of the dog can be harnessed to help get around. 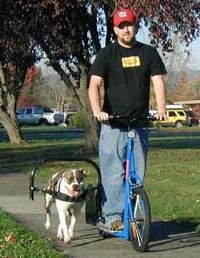 The scooter/harness lets the dog push the scooter - rather than pull as with a sled or on a leash. Steering and braking control are in the hands of the rider. The thrust/push needed- by the dog- to keep the scooter at speed on flat pavement with a 170 lb person on it - with the tires properly filled - and once the rider kicks to get it rolling - has been measured. It was 5 lbs.! 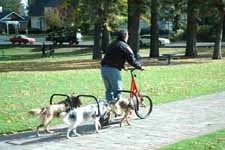 That's nothing - it has got to be less than pulling a sled per dog. And with multiple dogs- they don't even know they are pulling (er -- pushing)! So PETA and humane society people - take another look. Remember "Eight Below." The outrigger keeps your pal in one place - and the right-side location keeps Fido away from other pedestrians on the sidewalk or away from traffic. 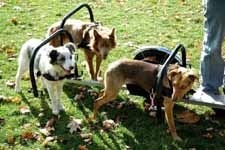 The scooter is customizable for up to three dogs at a time. Imagine that - three dog-power. How does that compare to horsepower? I don’t know - but those sleds in Iditerod move out pretty fast. And practical transportation in these times of high oil and gas prices and the search for alternative sources. You can become an alternative power driver (musher) too with the COOLEST GADGET - The Original Dog Powered Scooter.